If you had to eat out, where would you go? What would you choose? Korean, Japanese, or maybe Thai? Nepal’s own cuisine isn’t an option that most would even consider. After all, dal-bhat is a staple, something we all have at home anyway. But Nepali food goes beyond that, and there’s a whole culinary world that we are unaware of. Rakshya Khadka reports. 20-year-old Sushita Gurung has promised to treat her friends to a nice meal at Hankook Sarang after she gets paid this month. 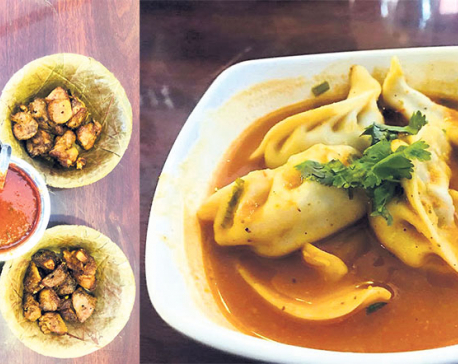 Like Sushita, 19-year-old Jeena Shrestha has plans to visit Boudha with her friends for some laphing, a Tibetan delicacy that is a spicy cold mung bean noodle, once the weekend rolls in. Food is an inherent part of our lifestyles, and indulging in good food is something we all look forward to. On most travel guides of Nepal, the singularity and diversity of Nepali cuisine is just as highlighted as its mountains and natural beauty. These guides discuss the nutritional content and traditional significance of Nepali food and deem it an important part of the ‘Nepali experience’. Considering this, one would assume that the Nepali cuisine rides high on the Nepali food market. It does but just as a staple. Almost every household begins and ends the day with platefuls of ‘dal-bhat’ (rice and lentil soup). But it’s necessary to remember that the diverse Nepali cuisine neither begins nor ends with a plate of ‘dal-bhat’. Prashant Khanal runs a blog by name of ‘The Gundruk’. He travels to remote areas of the country in search of local food. On his blogs, he posts recipes picked up from the kitchens of Nepali mothers, writes about forgotten grains and stresses on the need to preserve local Nepali food. “The vast majority of us haven’t even scratched the surface to knowing and understanding Nepali food. There are many grains, spices, herbs, and cooking techniques that are slowly getting lost. It’s quite alarming,” says Khanal. For a very long time, rice was the ‘rich man’s food’. Those with limited means substituted rice with other grains (barley and buckwheat) and they made their condiments from available spices and herbs. Because they couldn’t pick and choose, they made do with what they had. Thus came variations in Nepali food. Mass production and increasing import made what was once ‘rich man’s food’ accessible to all and this was naturally favored over the substitutes. “But these substitutes shouldn’t be forgotten just because what was once desirable is now easily available. We would be dismissing an entire culture of growth and progress then,” argues Khanal. That is one aspect of tradition but there’s an entire cultural diversity to consider. The indigenous communities in Nepal, Sherpas, Tamangs, Rais, Newars and many others boast their own array of food. But save for those that belong to these communities, awareness of one another’s food culture is next to nil. We have become a country that knows of fermented soybeans as a staple of Korean cuisine but are unaware that the Tamang community in Nepal have had ‘kinema’ (fermented soybean) for centuries. Papaya salads aren’t unique to just Thailand and other Asian countries in the South East. In various regions of Nepal, papaya salads are served with ‘sekuwa’ (Nepali roasted meat). But no one is to blame here. Historians agree that a cultural exchange between indigenous communities was a rarity from the very beginning. From marriages to discussions, all practices were confined within a community. So it isn’t anyone’s fault that there is a greater awareness of cuisines from countries that actively seek to promote theirs rather than the local ones that have, for a very long time, unwelcomed foreign participation. “And this is exactly why we need more Nepali restaurants to promote Nepali food,” says Reecha Shrestha. Having grown up on her community’s fiercely protected traditional food, Reecha appreciates Nepali food but admits that seeking them out takes extra effort. “There are too many restaurants opening everyday with their USPs as Mexican food, Italian food and what not. That is great but we’d like to see some authentic Nepali restaurants open up too. I’d love to try out Sherpa dishes but I have no idea how. It is easier to find continental dishes that it is to find Nepali food,” she says. Jeena adds that local food in Nepal itself feels like a foreign cuisine. Most first timers mention that ‘kinema’, the Tamang dish feels so very strange that they can’t take another spoonful. But ‘kinema’ is an absolute favorite among Tamang people who grew up eating it. “When we go to a restaurant, would we not choose dishes that we are certain are going to taste good? Those that we are used to eating. Maybe it’s the demand as well, restaurants serve food that people are going to love for certain rather than risk a different taste,” she says. There are local eateries, in great numbers and spread widely, and they sell typical Nepali dishes. But these places are hard to locate and the knowledge of their existence is limited to just the locals. “Had I not grown up in such a Sherpa food devoted family, I would have never known of the local eateries in Boudha. And most of these eateries start out with limited capital so the places aren’t well furnished or properly maintained,” says Jenny Sherpa. These local eateries don’t make up for ideal hangout spots and hygiene isn’t always guaranteed. “Also aren’t we a generation devoted to aesthetics? We’d rather post pictures of a cup of cappuccino in a modern decor restaurant than of a cup of local Sherpa tea taken under dim lights,” she adds. The need to promote Nepali food has become even more important. With multi cuisine restaurants popping up left, right and center, Nepali food getting lost in the buzz is a possibility. Most culinary schools in Nepal design their curriculums to encompass all cuisines both global and local. 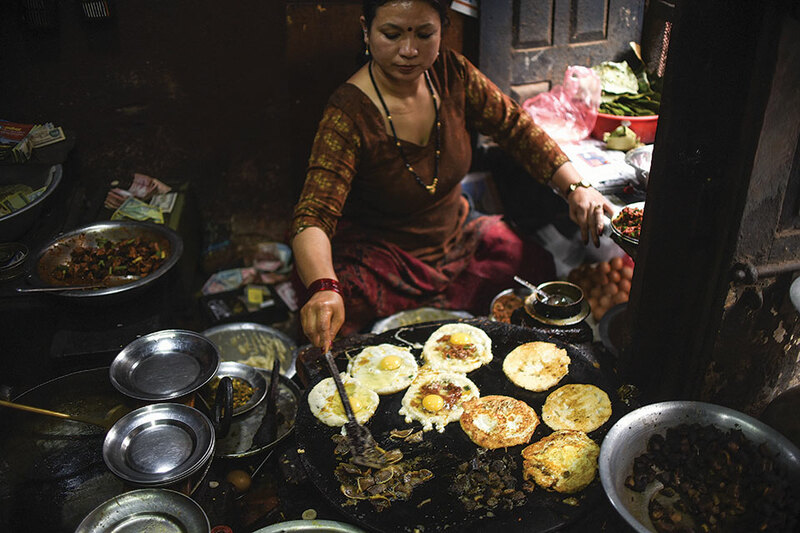 “But given the time it takes to master the basics of these many cuisines and the numerous know-hows of culinary arts, there isn’t much time to commit to Nepali food,” says Pushpa Raj Padal of Supreme Hotel School. There isn’t much documentation of Nepali food so there isn’t much information to go by either. What is taught in culinary schools in Nepal is limited to a few curries and basic dishes. Even in the final years of culinary school where people choose to specialize in a particular cuisine, rarely do people choose Nepali, Padal explains. To this, Nayan Pokharel, marketing director of Cocina Mitho Chha, a restaurant and culinary school, adds that the preference for foreign cuisine is apparent. It isn’t a surprise the Nepali market is brimming with professionals who, in the words of Nepali food writers, can make a better lasagna than a good ‘sel roti’. Raithaane is an authentic Nepali restaurant in Patan that stand by its mission statement: “Celebrating ancestral grains, wild harvests, and ethnic cuisine of Nepal.” Their sole focus is the promotion of Nepali cuisine among Nepalis. “People actually come searching for us. There is definitely an interest in the Nepali crowd. All that remains is to tap into this,” says the founder. And maybe there is hope after all. With a surge in the numbers of food bloggers and reviewers, the interest in local food is growing. And social media has power. It can lure hundreds of people to corners of the streets that sell local food or the small alleyways behind old temples that have sold traditional food for generations.